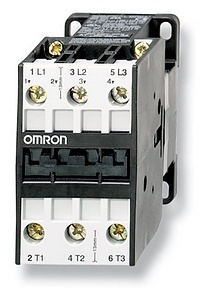 A range of Omron 3 pole contactors for switching mains voltage loads at up to 440Vac. These contactors can be DIN rail mounted or panel mounted. The coil voltage to activate the contactor can be 115 or 230Vac (depending on model). The current rating is a guide for the maximum current for switching heater element or similar loads. The 20A and 35A models have an additional auxiliary contact.